There are some successful examples of shared IT services at the local level, but more is needed and challenges can impede their growth. Editor's note: The Digital Communities Special Report, which appears twice a year in Government Technology magazine, offers in-depth coverage for local government leaders and technology professionals.View links to the entire report here. Shared IT services have been around for decades. During the mainframe era, large counties often shared their computing capacity with smaller municipalities. That approach still holds true today, with counties or states sharing data center capacity, such as processing and storage, with smaller jurisdictions. Since 2011, the city and county of El Paso, Texas, has been sharing servers and storage in a single data center. Similarly Ohio’s Computer Center, which is a consolidated computing facility for state agencies, is now providing server capacity to local governments, such as Cuyahoga County, which expects to save $1 million annually in IT costs, thanks to the agreement with the state. Counties have a long history of providing shared services to smaller local governments within their boundaries. The range of services is broad — from animal control to youth services. The economies of scale benefit smaller jurisdictions that cannot provide the services themselves in a cost-effective way. Counties also like providing shared services because it can generate an additional revenue stream. Participating local governments can also get access to innovative ideas, programs and systems. Introduction to innovation was one of the reasons behind Oakland County, Mich.’s announcement to expand upon its work of providing IT services to other local governments. For years the county had been a provider of computing services for 62 local governments in Michigan. Known as Access Oakland, the service also made money for the county, generating $17 million in revenue in 2011. To expand on the idea of government helping government, G2G Cloud Solutions was launched in 2012 as a way to make IT services available to any locality interested in participating, with the goal of eliminating infrastructure requirements or upfront costs to help them access technology that may not otherwise be within their reach. What Oakland County has done is a common kind of shared service, where one government provides many or most of the services for the smaller jurisdictions. But the arrangement can also take place with other types of governmental units. For example, Marathon County, Wis., and the city of Wausau, Wis., get their IT through a shared service operated by the City-County Information Technology Commission. The shared services provided by the commission are broad and deep. Both city and county get their networking, data processing and more than a half-dozen mission-critical applications, including document imaging, financial, GIS, health care, law enforcement, timekeeping and land records, through the commission. The idea of large counties providing shared IT services to smaller local governments makes perfect sense. So too does the idea of medium or even large city and county governments (think El Paso, San Francisco, etc.) sharing IT services. Another form of shared IT services is the consortium approach, where a number of governments band together to share IT services. The question is, why aren’t more local governments sharing IT services? Roy Mathew, a partner with Deloitte Consulting said he believes that many local governments consider themselves too different — in terms of policy, administration changes or revenue streams — to pursue the possibility of a shared IT service agreement. “Discussions become more contractual and legal and so the shared service doesn’t really get off the ground,” he said. Given all the challenges that can sidetrack shared IT services, the Digital Towpath consortium is unique for its longevity and success. Started in 1998 with just eight communities, DTP set itself up as service for the smallest local governments, with the goal of using the newly emerging Internet as the platform to deliver needed technology services. Shared IT services in the federal government can be traced as far back as the 1980s with the introduction of interagency cross-servicing initiatives, such as payroll and the consolidation of administration services. By 2000, with the introduction of e-government, shared IT services got a boost from the concept known as Lines of Business, which looked at common business functions across the federal sector to find ways to streamline and share. These included financial management, human resources, geospatial, grants management and eventually infrastructure. 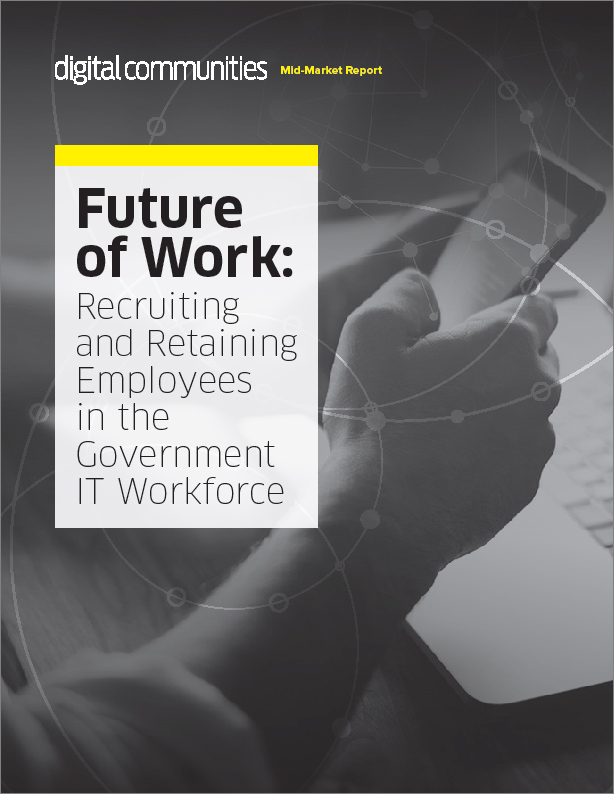 In 2012, the Obama administration released its Federal IT Shared Services Strategy, which gave CIOs guidance on implementing shared services as part of an effort to reduce waste and redundancy. In 2014, the Office of Management and Budget along with the Department of Treasury designated the departments of Agriculture, Treasury, Interior and Transportation as approved shared service providers for financial management across the federal sector. Last year, oversight of shared services was transferred from Treasury to the General Services Administration. By creating the new Unified Shared Services Management Office, the GSA wants to broaden the shared service focus from financial systems to include other important services, such as procurement, payroll and grants management. This move marks the third time a new entity has been formed to oversee the implementation of shared services and encourage agencies to migrate to one of the federal shared service providers, according to Federal Computer Week. Shared services at the state level are both intra-governmental and inter-governmental. 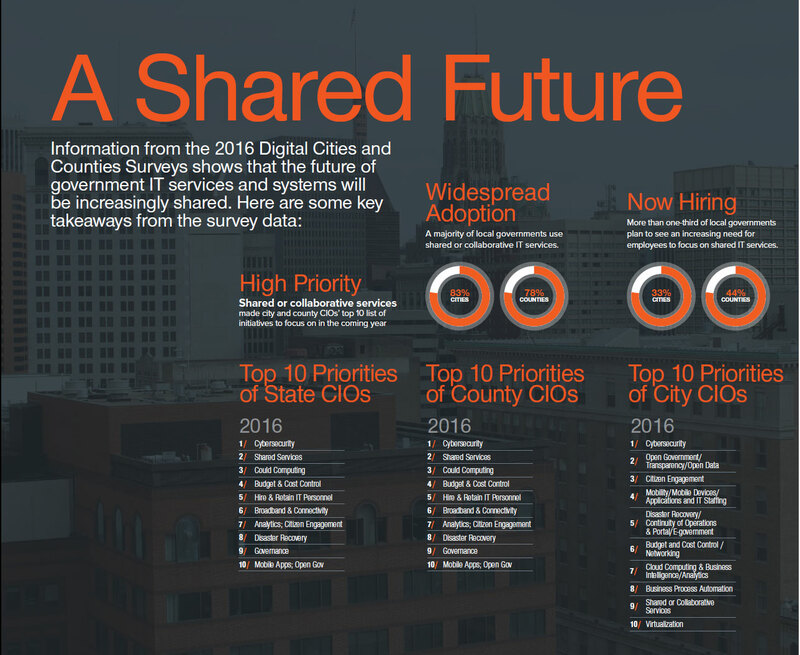 The issue is a high priority for state CIOs, ranking right up with cybersecurity, according to surveys conducted by the Center for Digital Government. States that are heavily federated and decentralized have turned to shared services to reduce IT costs by eliminating redundancy among agencies and departments. But states are also practicing inter-governmental shared services. For example, Idaho’s Department of Labor has licensed its Internet Unemployment System (iUS), which launched in 2014, to Iowa and Vermont. The three states have formed a consortium to share the technology, which can quickly process unemployment taxes and benefits, with the hope that more states will join. Idaho has been coordinating specifics and identifying goals with Iowa and Vermont and began coding in July 2016. The project is expected to take no more than two years to complete before iUS is launched in both states. Utah has also turned to software licensing to share one of its more successful IT projects with other states. The Automated Traffic Signal Performance Metrics program has improved the state’s traffic signal timing functions while generating metrics, such as the percentage of vehicles that are arriving on a green or red light, and how the traffic is flowing. This has led Utah to significantly reduce the number of stops at red lights. The software program is available to other states, with nearly a dozen using it to date. “The goal was to come up with a service that would take out the knowledge of technology from the process, so that our lack of technical background wouldn’t get in the way of using the Internet for public service,” said Brown. In upstate New York, a consortium of 150 towns and villages share email, content management and other IT services. Coming next will be an electronic records management system and a code enforcement and tracking service. There’s even talk of having a chief security officer-as-a-service for towns that need extra cybersecurity support. The shared IT services model is important because some of the towns are so small, they rely completely on part-time staff. And few have the resources to purchase their own off-the-shelf IT applications. The consortium has been in operation since 1998. “We had a private community cloud shared service before there was such a term,” joked Jeanne Brown, project director for the consortium known as Digital Towpath, named in honor of the Erie Canal, a landmark infrastructure project, which spurred a vast economic transformation when it was constructed nearly 200 years ago. Today, Digital Towpath (DTP) is a form of 21st-century infrastructure and an effective way for local government to keep up with technology using shared services and help the towns and villages of the state stay vibrant. DTP’s growth has largely occurred by word of mouth. The consortium has to keep a cap on membership because of limited staff and a wish to provide reliable services to the existing members. Dues of just over $1,000 annually provide revenue, while grants, primarily from the New York State Archives, helped cover software development costs. Right now, DTP is working in partnership with the Center for Technology in Government, an academic research organization that focuses on IT in government, to develop a shared electronic records management system (ERMS). The effort will focus on “born digital” documents and provide local governments a way to manage records through their life cycle in a cost- and time-effective manner, with the goal of also providing greater public access to critical data, according to G. Brian Burke, managing director at the Center for Technology in Government. “One challenge has been getting the towns to recognize the secondary uses of the data,” said Burke. “Land records, environmental impact records and open meeting records may have value to others for other reasons. A well-constructed ERMS has the potential to make records more accessible to other government departments and even for public access, in the spirit of open government.” The ERMS will be available to all local governments in New York, not just members of DTP. The problem DTP and other shared service consortiums face is balancing the demand for services with the need to keep costs low. Annual membership to DTP provides towns and villages with unlimited access to its content management system and unlimited accounts to its email service, all of which are managed in a secure cloud environment. But the service doesn’t generate enough revenue to hire more staff so the consortium can expand membership and add new services. “Members would definitely like a financial management system as a shared service, but we don’t have a way to afford that now,” said Brown. Even cloud computing, which makes the sharing of services much easier, has its limits. Brown pointed out that originally, all public records had to reside on a server in New York, because of state record laws. That limitation has since been relaxed, making it possible for records to reside in a cloud environment somewhere in the U.S. But some public officials are uncomfortable with the idea that they can’t get their hands on the actual records.